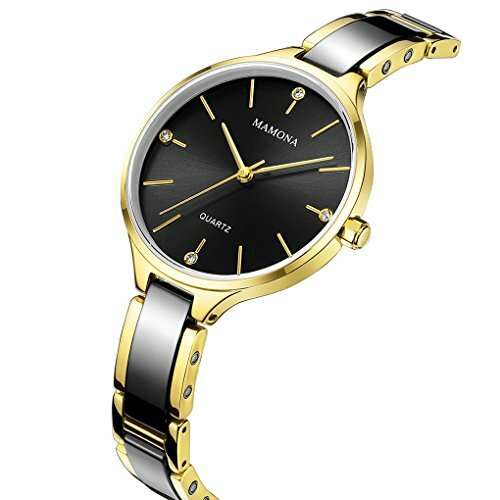 MAMONA Quartz Watches for Women Waterproof Black and Gold Ceramic Ultra Thin Fashion Wrist Watch L3877BK. This is a very well made watch, simple and elegant ,which is an IDEAL GIFT for someone important to you. It comes with a gift boxbecause we know a happy wife/daughter/mother/girl friend also makes you happy. 1.NO CRYSTAL CHIP. Scratch-Resistant sapphire crystal. Because we know replacing crystal is such a Hassel. • Clean the strap by a soft cloth (included) on regular bases is highly recommended. Exquisted package : This MAMONA watch is well packaged in a stylish watch box, what’s more we also provide the free polishing cloth for cleaning your watch case .This watch will be a good gift for your relatives and friends. Adjustable Watch Band , This watch fits wrist up to 7.5″ (Approximately )/If it is too short , please contact with us , we will arrange the watch link to you .Otherwise , you can ajust the watch band on your local jewelry or watch shop as well as you can do it by yourself according to our instruction . ACCURATE TIMEPEICE. Original Japanese Quartz Movement, provide precise time keeping. 3 ATM Waterproof: 99 Ft / 30 M. It is OK to wear it when wash hands etc., but not for swimming , shower or diving . Risk FREE: Since your satisfaction is our top priority, we offer 2 year warranty and unconditional money back guarantee policy! Just in case you have any issues with our watch or bracelet, feel free to contact our friendly customer service so as to get a replacement or a refund!